The first thing when you prepare basting is to cut the backing and the batting at least 4 inches larger and 4 inches longer than the top. Draw a mark on the middle of your table. 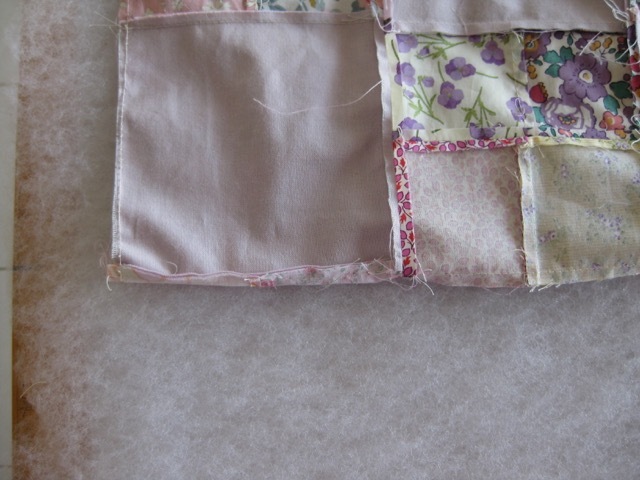 Fold your backing in two lengthwise, wrong side against wrong side. Line it up with the mark. Open and fix it with a tape. Do the same with your batting. 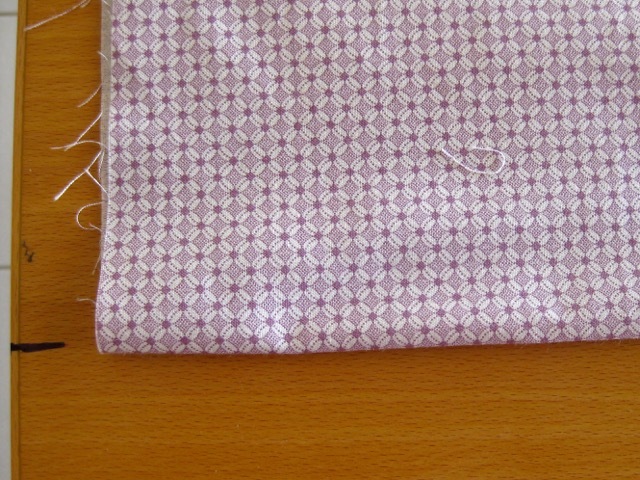 Then fold your top in two lengthwise, right side against right side and line it up. This is what you obtain. These are the tools you need for basting your three layers. 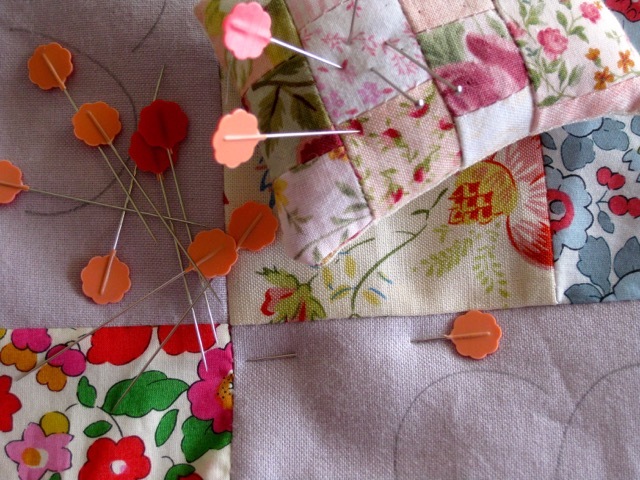 Before stitching, put some pins to maintain the three layers together. 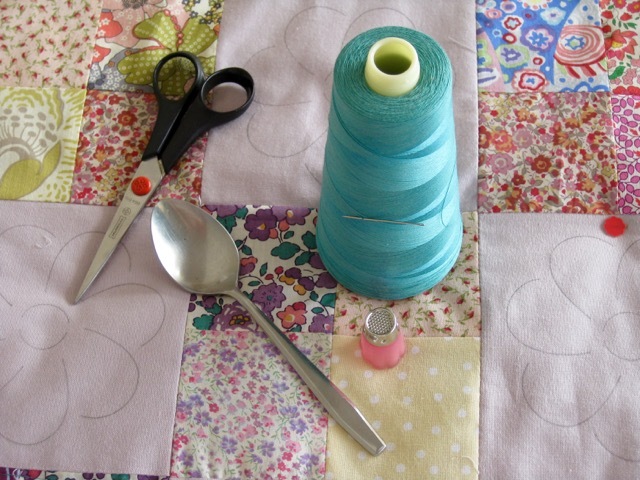 The spoon will help you to lift and grasp your needle effortless without moving the quilt. 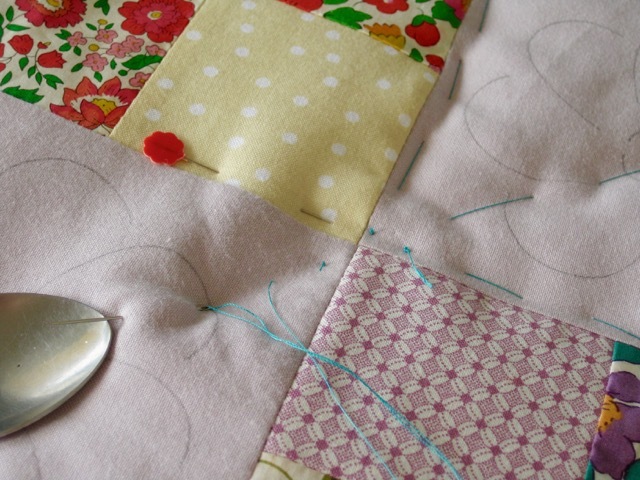 Start from the middle of the quilt and stitch diagonal lines with big stitches. 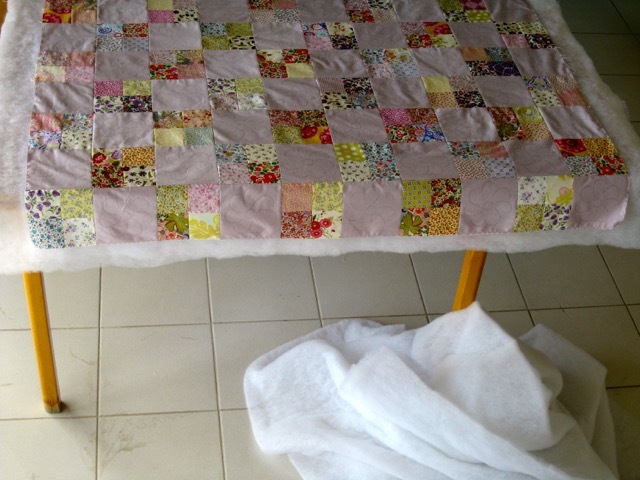 The quilt is now ready to be fixed on the hoop for hand quilting. Thank you! I have used safety pins, thinking they're a quicker solution. Now I think the needle and thread are the better option. I will try it! What a great tutorial. Your photos are gorgeous as always. 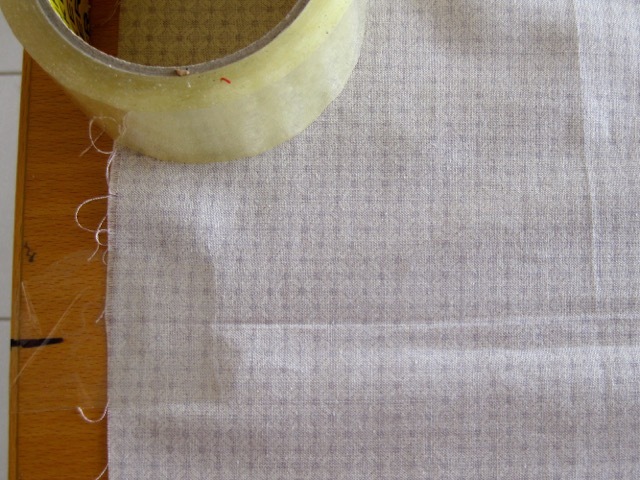 I pin baste on my design wall, but have wanted to try it on the table top. I like that you use needle and thread. 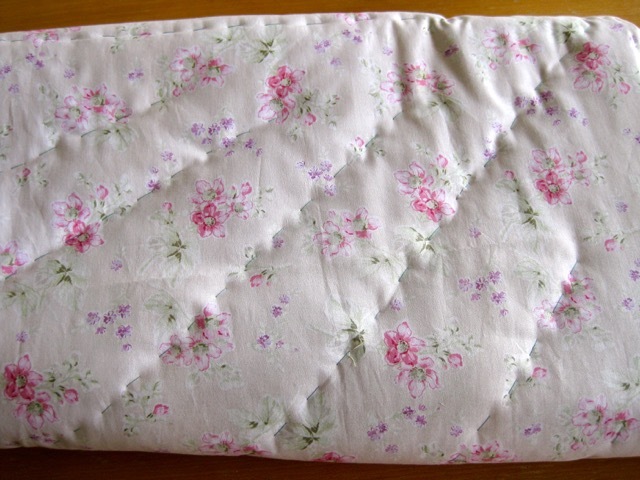 That would be much better for quiltng in a hoop. 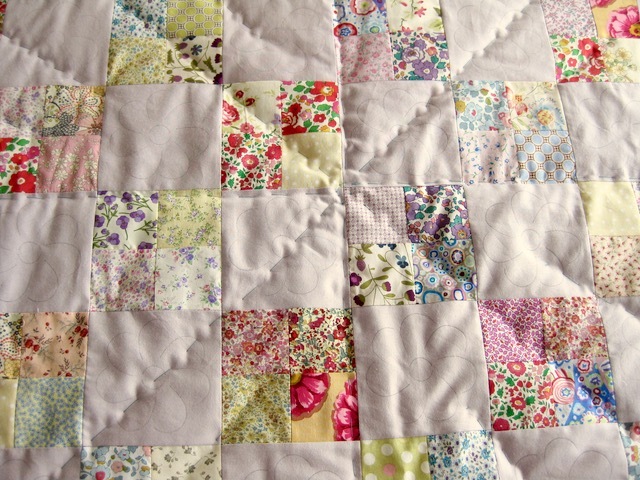 Bon quilting! J'aime bien l'aide de la petite cuillère. Thank you for sharing! I've never basted this way before! I have never seen anyone use a spoon to baste, unless it was for a turkey, LOL. A wonderful tip! Thank you Christine. Thank you for good idea of stitching!! I love the spoon trick... I will do that next time!!! Thanks! Like the idea of the spoon. I am going to try that! THANK YOU! I AM OPEN TO LEARNING NEW THINGS! 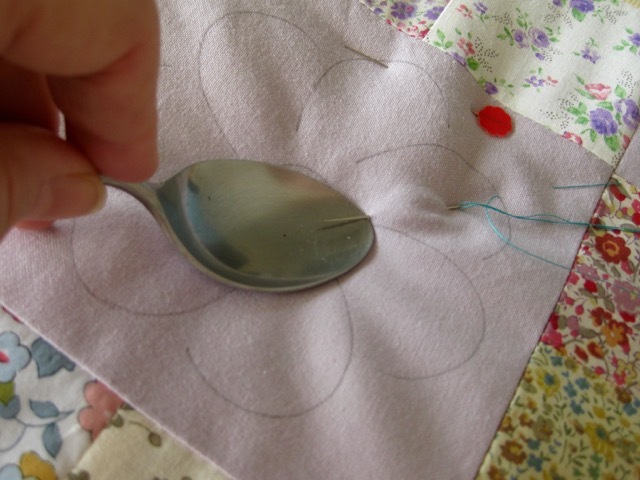 NOW I KNOW HOW TO LIFT MY NEEDLE WITH A SPOON! !